"How many times have you wished you could make music? Well now you can! All you need is a tape recorder, some relatively simple skills, some curiousity, and a little imagination. This book has been used in classrooms throughout the country by students, many of them without previous experience in music, who are now composing electronic music projects. 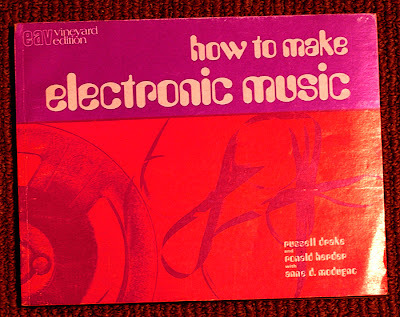 In this book you'll be taken into the exciting world of electronic music and you'll find the basic tape recorder as well as synthesizer techniques, explained in many step by step instructions, and a variety of experiments to help you make electronic music. You'll also find a whole set of composing projects where your own creativity can run free and you' will wonder why you didn't start sooner." is a combination of oscillators, filters, ring modulators, etcetera, which are all devices invented that were developed individually over time. When enough components had been invented for controlling all the elements involved in the creation of sound, they were compiled into a single unit and called a synthesizer. In the same way pressure drives a flow of water or steam through pipes an electromotive fore called voltage drives electric current through the circuitry of any device that uses electricity as its power source. Working with a synthesizer, the composer can regulate a components by hand or they can take advantage of automating voltage control for accomplishing the same task with a higher degree of precision and speed impossible with manual control. For example, you can open or close switches by hand, or turn a volume knob, yet voltages can perform operations at the rate of several hundred or even several thousand times pers second. Because this driving force can be applied in a vast number of ways to affect all of the elements of sound frequency, timbre, amplitude, and duration; the advantes to the composer are enormous. Some of this choice (manual control versus voltage control) is determined by the peticular components being used, since not all components produce voltage and not all components can be voltage controlled. You must use a control voltage source for regulating a voltage controlled unit. We will discuss this important interaction in greater detail. To start, however, not the labeling on the synth control panels for three of the most essential voltage controlled modules: VCO, for voltage controlled oscillator; VCF for voltage controlled filter, and VCA, for voltage controlled amplifier. 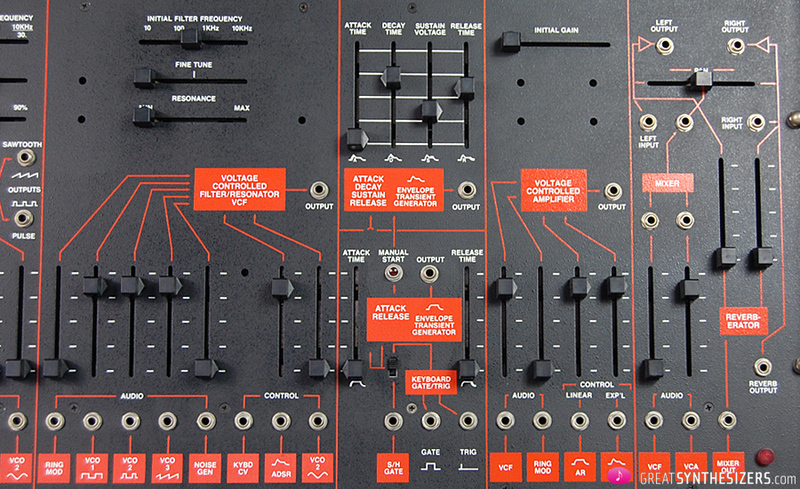 The three main bodies of components used to synthesize sound are typically installed on the control panel for left to right(the same path taken by the audio signal as it moves across the sound production circuits. In order, these are the sound sources, the sound modifiers, and the controllers. The synthesizers principal sound sources(some of which may also function as voltage controlled sources) are the oscillators. These produce for typical basic waveforms(sine, triangle, sawtooth, and square) with individual timbres, controlling frequencies, and fixed ampolitudes. The frequency of the selected waveform(which can be regulated by manual or voltage control) can be anywhere in or out of the audible range: from sub audio frequencies below 20 hz to ultrasonic frequencies above 16,000 hz. The noise generator produces a mixture, called white noise, resembles the hissingwhen found tuning between radio station frequency bands. (Sound waves producing noise emitting from the very Sun nin our solar system) Since the ear is more sensetive to high frequencies, white noise seems high pitched. Some of the high frequencies can be finltered out to obtain a more audibly balanced mixture called pink noise. Noise is used mainly for creating percussive type effects and to colour other sounds. Modulation in general is a form of control. In the case of sound sources, modulation is controlling the frequency, either manually or with control voltage from other sources. For example, the frequency of one oscillator signal can be voltage controlled by the signal of a seconf oscillator. The one being controlled is called the audio signal, or carrier; the signal which does the controlling is called the modulator, or program signal. In this interaction of two signals, it is the modulator's waveform that determines the frequency change of the carrier. In fact, you can actually hear the controlling waveform if its frequency is sub audio: Sub audio sine waves produce a frequency change in the carrier that smoothly rises and falls in effect a siren sound. Sub audio triangular waves produce a frequency change that gradually rises, the immedeately begins a gradual fall. Sub audio rectangular or square waves produce a frequency change that abruptly alternates between two frequencies, with no perceptable sloping. Sub audio sawtooth waves produce a frequency change that gradually rises the abruptly falls. If, however, you increase the frequency of the modulator into the audio range, you no longer hear its waveform yet now hear an entirely different result: the generation of frequencies in addition to the carrier and modulator frequencies. These additional frequencies, called sidebands, are non harmonic overtones which produce complex new timbres. Besides frequency modulation, there are two other modulation techniques. Sound sources can be used alone or in combination , as is or modified in a number of ways. one modification process, called subtractive synthesis, involes use of synthesizer audio filters. Filters are modifiers that change the timbre. they do this by subtacting any part of the frequency range of any sound above or below a variable cutoff point. Depending on the filter, the cutoff point can be manually controlled, or both manually and voltage controlled. The high pass filter subtracts the frequencies below the cutoff point and passes those abvove. The low pass filter subtracts the frequencies above the cutoff point and passes those below. The band pass filter, with two cutoff points, subtracts both the high and low frequencies and passes the center frequencies. The band reject filter, also with two cutoff points, subtracts or rejects the center frequencies and passes both high and lows. The fixed filter bandk divides the entire audio frequency range into a number of bands which can be subtracted from the whole, either individually or in any combuination . It has manual controls to pass or supress each individual band width. Since filtration deals with a variable cutoff point, the composer is working with an adjustment element that can be regulated either by hand or by voltage control. Voltage control has superior advantages of speed and precision in controlling a specific synthesizer module function. This is obvious with the voltage controlled low pass filter. The lowpass filter is the most frequently used in electronic composition because of its usefulness in passing the fundamental and altering the overtones. If you were to vary the cutoff point by hand, moving it quickly up and down, you would be alternately passing and rejecting a certain band of overtones. This action alternately enriches and dulls the sound without changing the pitch, creating that ever familiar wah-wah sound. However, you can get the same effect by using a sub audio waveform from an oscillator as control voltage. (Using different forms of control voltage from sources other than an oscillitaor will produce various types of effects.) Besides being a more precise way to control the opening and closing of the filter, voltage control has the other obvious advantage of freeing the composers hands for manipulating other controls manually. Another feature of the low pass filter is the resonance or regeneration control. This control emphasizes the overtones closest the cutoff point, thus brightening the sound. Sub audio sine waves gradually increases then gradually decreases the loudness. Subtractive audio rectangular or square wave alternates between two degrees of loudness. used in conjunction with manual control, the lower amplitude level can be set, if desired, to preduce zer amplitude(silence). This would have the effect of turning the amplifier on and off. The rate of speed at which alternation occurs is determined by the frequency of the controlling waveform. When you increase the frequency of the modulator into the audio range, you will hear additional frequencies. This modulation technique, called amplitude modulation (AM), produces fewer additional frequencies and consequently, a less complex timbre than the similar technique of frequency modulation (FM). The most frequent used control voltage source for a VCA and probably the most important to the composer is the envelope generator. The VCA and the envelope generator, working together, shape the sound's envelope by using the generator's seperate controls for attack/decay/sustain/release ADSR. These controls, which determine duration for each enevelope phase, can be set by the composer to produce a phenomenal range of envelope shapes: the envelope of any known sound, custom shapes, even backwards sounds. As a control voltage source, the envelope generator can be used to control not only the amplitude yet also frequency (via controlling an oscillator) and timbre (controlling the filters). A synthesizer keyboard is different from a piano or organ keyboard. As a control source, each key when depressed releases a different preset voltage. As in the case of the envelope generator, this voltage can be used to control frequency, timbre, or amplitude, alone or in any combination. The increase in pitch level is a result of frequency control of an oscillator. Increased brilliance is a result of raising a filter's cutoff point. The louder sound results from control of an amplifier. One of the most frequently used combinations is simultaneous control, by the same keyboard voltage, of both an oscillator and a filter. This maintains a constant relation between frequency and cutoff point, producing a range of different pitches that have the same timbre. 1 Depression of a key triggers the beginning of the evelope cycle. 2 Following attack and decay, the sustain state is maintained as long as the key is held down. 3 Lifting the key triggers the release phase of the envelope. Tuning Control regulates pitch over an extremely wide range: tuning to concert pitch, to accompany instruments, or for transposition. Scale Control regulates the intervals between keys: from microtones through conventional half steps to larger intervals. Portimento or glide control regulates varying degrees of glide between pitches. These controls produce a similar effect on timbre an amplitude. Microtone tuning, for instance, used with an amplifier, can produce cresendos and diminuendos. The ribbon controller is a metal ribon that produces a varying voltage when you move your finger along its length. The result is similar to the gliding effect produced by the portamento setting of a keyboard, but the more direct means of control enables you to produce minute variations as well as sweeping effects. 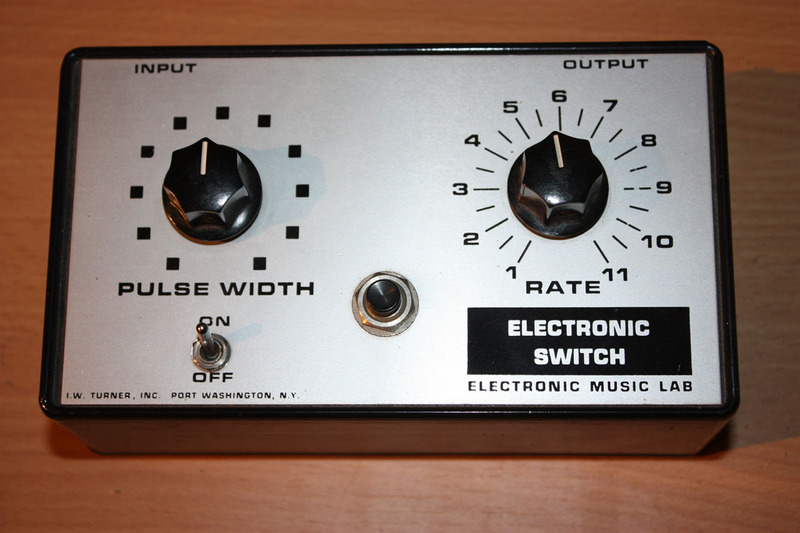 A foot pedal produces a control voltage which is varied by foot pressure. Although the degree of control is less precise than that provided by a ribbon controller, the foot pedal has the advantage of freeing the composer's hands for other functions. This is of peticular advantage in live performances where subtlety of control is frequently sacrificed to speed and flexibility. 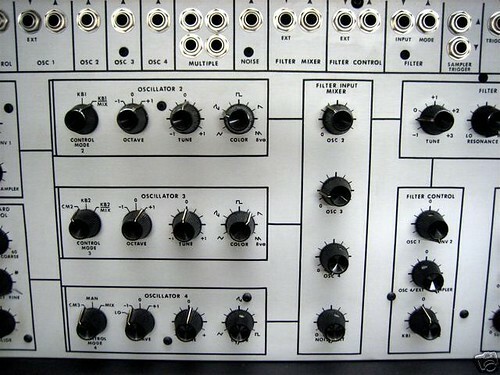 A sampler produces a sequence of control voltages. When it recieves a trigger impulse it samples a voltage level of a waveform and holds the level until it is triggered to make the next sample. The result is a voltage sequence of different levels. The form of the sequence is determined by the form of the sampled wave. A triangular wave will produce a sequence of increasing and decreasing levels which, if used to control an oscillator, will produce ascending and descending pitch sequences resembling musical scales. A random waveform, like noise, will produce a sequence of random voltage levels. The sequencer is a complex controller which gives the composer precise control over a number of aspects of a sequence of pitches. This is possible because each stage of the sequence produces up to three seperate voltages which can be pre set to control simultaneously the various elements of each sound in the sequence. For example, one voltage can control frequency; another, amplitude; a third, either timbre or the rhythmic structure of the sequence itself. Ring modulation produces an effect closely related to amplitude modulation. Whereas AM produces frequencies in addition to the frequency of the signal being modulated, ring modulation produces the same frequencies but eliminates the original signal. The result is unusual, rather bizarre forbidden planet timbre. The synthesizer's reverb unti artificially creates degrees of reverberation. Like any other modification techniques, reverb can be applied to signals either produced by the synthesizer or from external sources. The switch interrupts the flow of a signal by opening and closing the circuit. The pre amp brings low level signals from microphones or other low level external inputs up to the levels used by the components of the synthesizer. High level signals from tape recorders, for instance may be routed directly to any components without being pre amplified. An unlimited array of external sources are available to the composer for synthesizer modification. Any sound that can be taped or picked up by microphone can be modified. 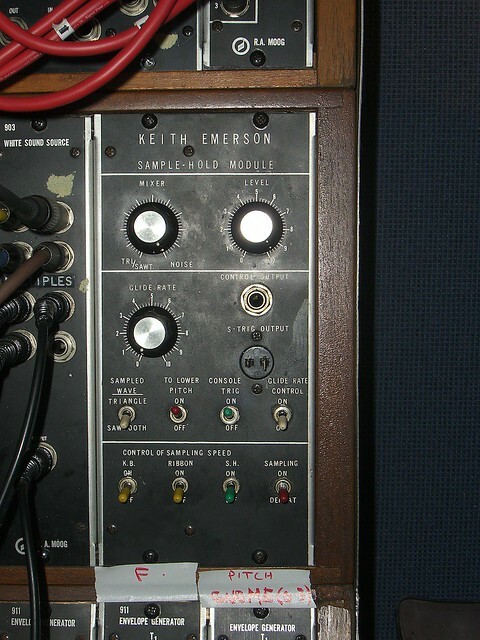 Sounds from radio, TV, a record player, as well as any electronic instrument can be fed directly into the synthesizer through external line input, then subsequently modified. These modifications include filtration, amplitude modulation, ring modulation, switching, reverb, as well as the control of envelope shapes on the external signals. I was given this book years ago plus mysterious 7" Record titled Synthesis by Herbert A. Deutsch by my old mentor Russ that has thus exceptionally influenced my path since that magic time.